Hughes Engine, manufactured in Cornwall in 1862 by Harvey & Co, and erected in 1865, served the Moonta Mines for 58 years. The adjacent boiler house was originally designed for three Cornish boilers (Edward Higginbotham, 2006). Deposits of copper were located on the Yorke Peninsula by a shepherd in 1859. W. W. Hughes and J. Duncan, the pastoral leaseholders, purchased the mineral leases and formed the Wallaroo Mining Company in 1860, bringing a team of miners from Burra to start work. In 1861 a second major find was reported and the mining lease also secured by Hughes, who formed the Moonta Mining Company. After both the Wallaroo and Moonta discoveries, there was a rush to purchase other leases in the area and numerous other companies were formed. The Wallaroo and Moonta mines were run as separate enterprises until 1889-1890. The Wallaroo mine employed large number of Cornishmen and a series of Cornish mine captains from 1861 onwards. Drainage soon became a problem. A horse powered engine and a series of horizontal steam engines were first used for pumping, stamping and hauling. The first of a series of Cornish engines was erected in 1863, followed by several others up until the 1880s. Production in the 1860s was highly profitable, reaching 26,000 tons of ore by 1869. Peak production was reached between 1870 and 1875, when the workforce numbered over a thousand. Higher extraction costs and lower copper prices forced the company to largely suspend working in the late 1870s, when about 350,000 tons of ore at 10% copper had been mined. The Moonta mines also proved very profitable from commencement, producing nearly 5,000 tons of ore worth £67,350 in 1861 alone. By 1871 the mine had produced £680,000 in dividends and surpassed £1 million in dividends by 1876. Again managed by Cornish captains, the mines were rapidly developed, employing over 1,200 by 1865. 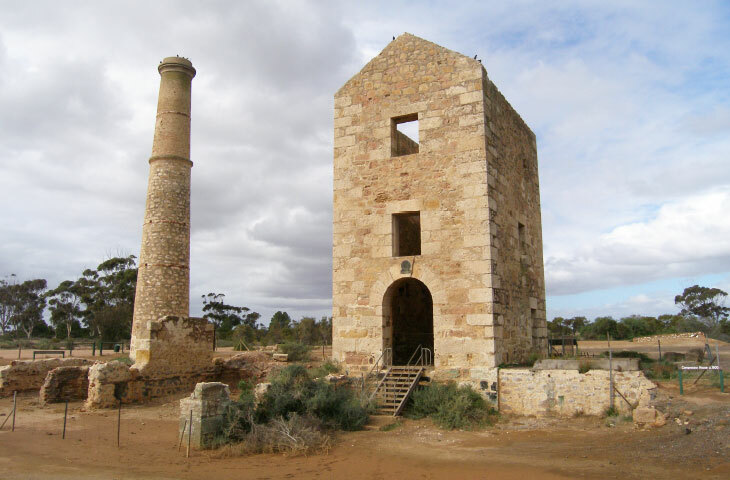 A total of four Cornish engines were erected at Moonta, from 1865 up to 1874, one remaining in operation to 1923. By 1870 the mine was producing more than 20,000 tons of ore annually, averaging 20% copper, and employing 1,700 people. By 1889, Moonta had raised ores worth £5.4 million. Both mines suffered from depressed conditions in the late 1870s and 1880s. They were amalgamated in 1889-1890 as the Wallaroo and Moonta Mining and Smelting Company. Thereafter underground production from the Moonta mines became limited to the higher levels, with materials and labour being transferred to Wallaroo. Both mines were modernised, though Wallaroo became the focus of activity. From 1900 the Cornish engines began to be replaced by electric pumps, steam winches and engines powered by compressed air. The new company employed an average of 1,900 people from 1889 to 1923, with a peak of 2,700 in 1906. Full production continued up to and including the First World War, but reduced copper prices in the post war era forced the mines to close in 1923. Small scale mining operations continued at Moonta until the 1940s. By 1923, Moonta and Wallaroo had produced 350,000 tons of copper to the value of £20.4 million. During the lengthy mining period, Wallaroo became the seaport for the local mining industry. A pier and tramroad to the mines were constructed in 1861, along with a smelting works. The town of Wallaroo took on a distinctive Welsh character, with Gaelic being spoken by the smeltermen and their families for many years. The works smelted the ores from both the Wallaroo and Moonta mines from 1861 through to their closure in 1923. The Welsh reverberatory furnaces were constructed in 1861 under the supervision of Leyshon Jones, who had worked at both Kapunda and Burra. The works was the largest outside Swansea, producing up to 100 tons of refined copper per week by 1868. In 1865 the furnaces were converted to use coal, shipped from Newcastle in New South Wales. Low grade ores were back loaded to Newcastle, where the company erected smelters, which remained in operation until 1893. With the formation of the amalgamated mining company in 1890, the smelting works was modernised and also diversified for a short period into the refining of gold, silver and lead, as well as copper precipitation. From 1910 modern methods of smelting were introduced using the Bessemer process. “From the bob-platform of Prankerd’s engine house, which is near the centre of the mines, a very comprehensive view can be obtained. Among the smaller houses of the miners can be distinguished sixteen churches and one building which has been a church. All or them are large, comfortable buildings, the Wesleyans, Primitive, and Bible Christians being the only denominations represented on the Mines, with the exception of he Salvation Army.” (Oswald Pryor. Australia’s Little Cornwall. 1962, reprinted 1989, National Trust, Moonta Branch. 99). By the end of mining in 1923, three generations of Cornish and Welsh had worked at Moonta and Wallaroo. With the “scattering of the bal”, this community was dispersed, though Cornish traditions and the remnant landscape survive. One of the Cornish boilers from Hughes Engine and Boiler House. 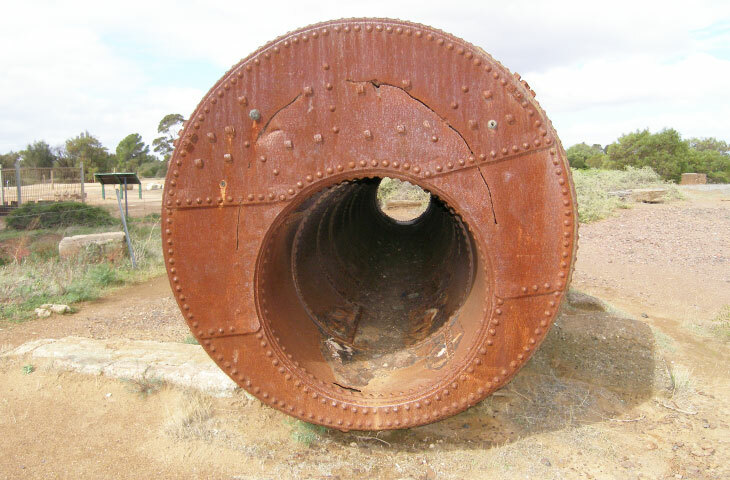 The flat plated end is similar to the boiler at Cadia, New South Wales (Edward Higginbotham, 2006). 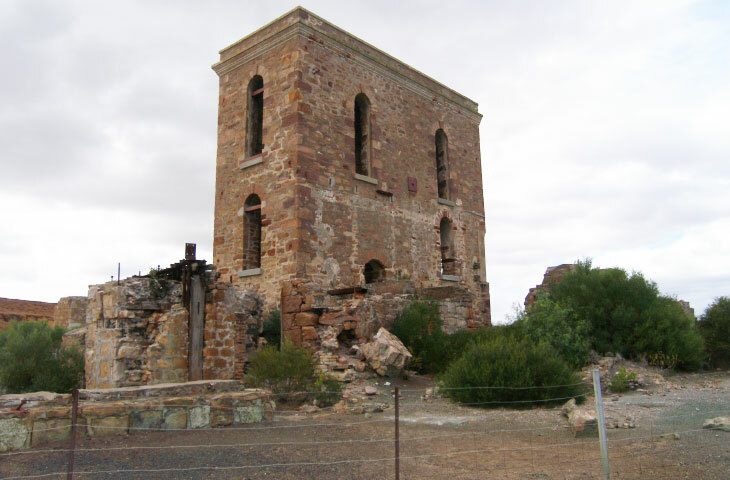 Harvey’s Engine House, erected in 1875 at the Wallaroo Mine, Kadina, South Australia (Edward Higginbotham, 2006). 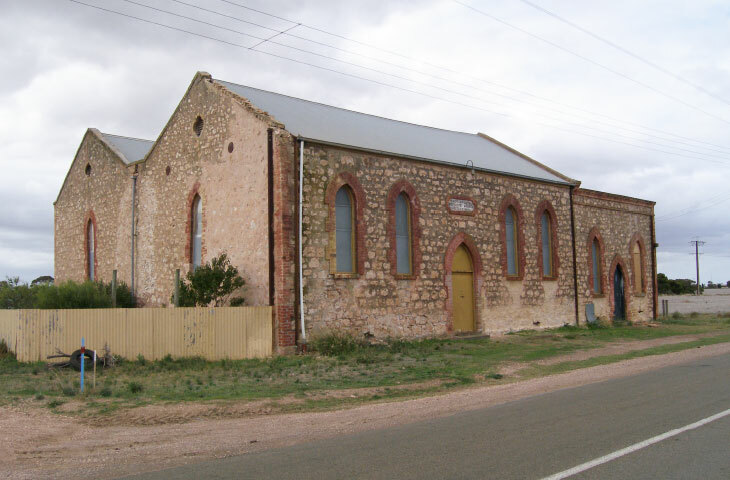 The East Moonta Methodist Church, established in 1869, is typical of Cornish non-conforming chapels, several of which survive around the Moonta mines (Edward Higginbotham, 2006). 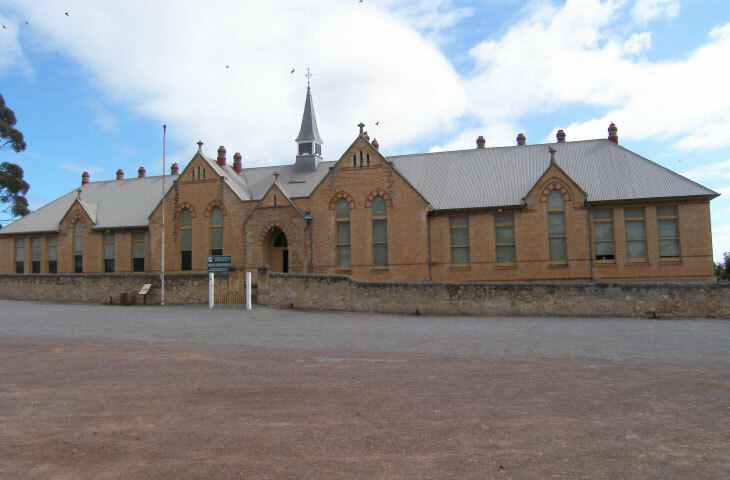 The Moonta Mines School, built in 1878, demonstrates the strength of the Cornish community in the Copper or Cornish Triangle (Edward Higginbotham, 2006). 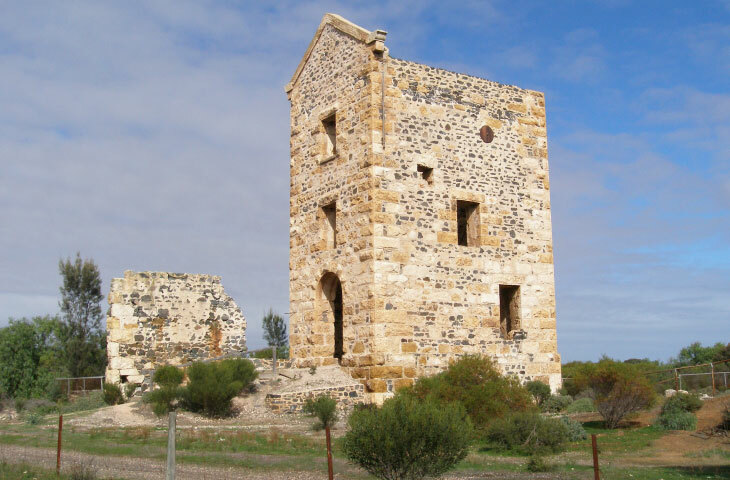 Richman’s Engine House, constructed between 1867 and 1869 at Moonta, is unusual in Australia. It is called a whole engine house, because the bob is completely housed within the building. In most other engine houses, the bob is partially exposed outside the building – a half engine house. In the whole engine house, the bob wall is in the centre of the building, whereas in a half engine house, the bob wall is the end wall (Edward Higginbotham, 2006).